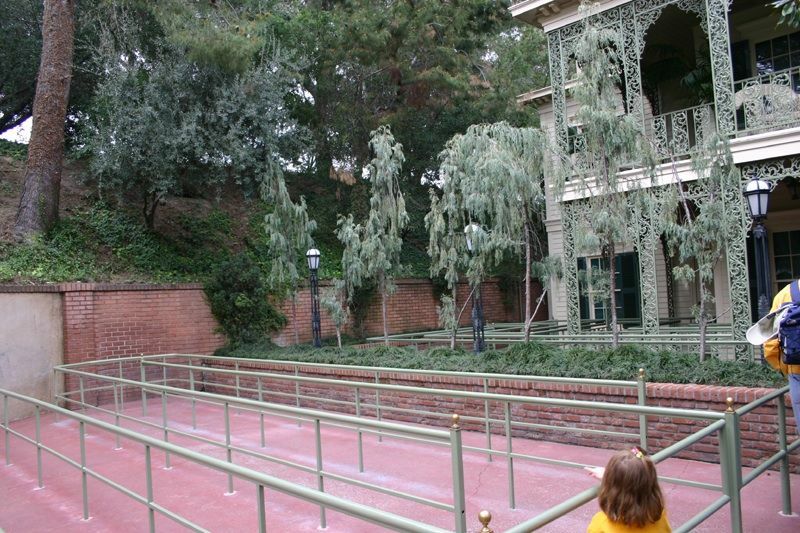 ...but the queueing area down below remained the same, still looking much as it does in these older photos: . "That's my favorite brass knob. That one, right there." I'm old enough to remember this section when it hosted the family plot graveyard, a short-lived minor masterpiece remembered today by few. 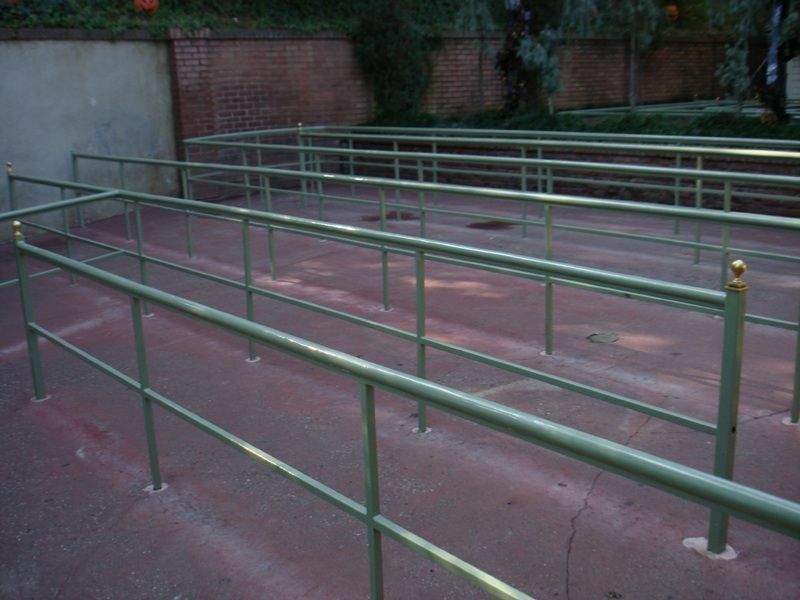 Back in the opening year, when a much higher percentage of riders had no idea what lay in store for them, the queue graveyard was virtually the only clue you had as to the tone of the attraction. Plus, the lines were longer and slower back then, so you had plenty of time to contemplate the epitaphs (and if you were a geek, to memorize them). If you're a Mansion fan, you really ought to know about this long-forgotten gem. 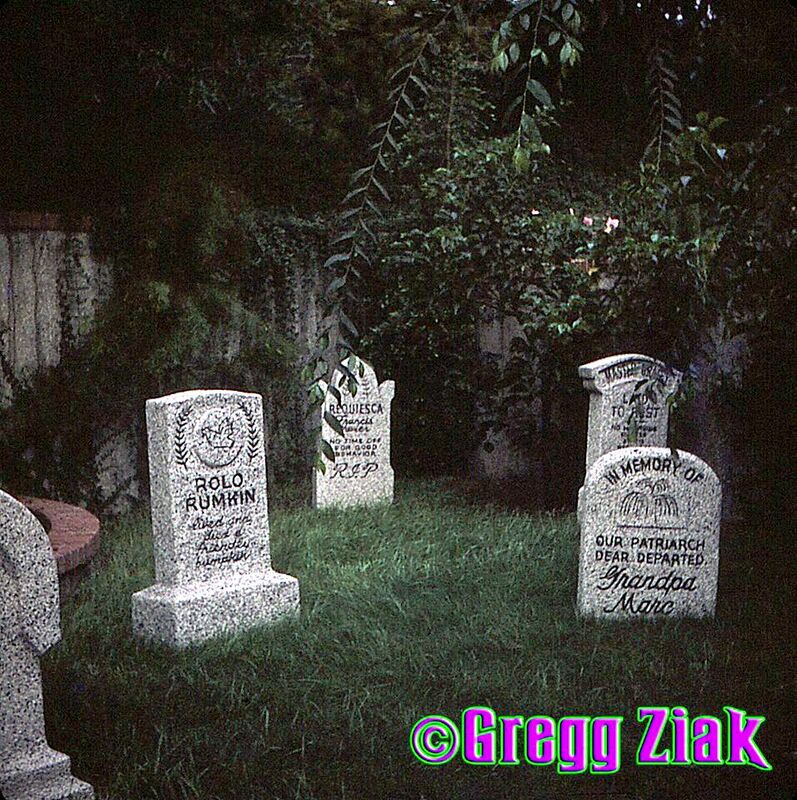 I also mentioned that you could get a glimpse of the old graveyard in the 1970 Osmonds Disneyland Showtime episode, which featured the HM. I figured I'd put up some of the better photos I've got rather than that ugly little montage. I'm not at liberty to show you every photo I've got, but these are among the best. This first is actually a bw photo by Athenamama that I've colorized and processed in various ways. Turned out nice. of how the brick-and wall- work, uh...worked. 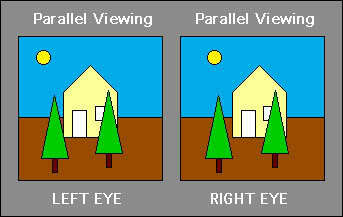 Compare it with the above photo. ...and from that wretched photo a serviceable rendition of the boneyard sans Osmonds (and Kurt) can be made. 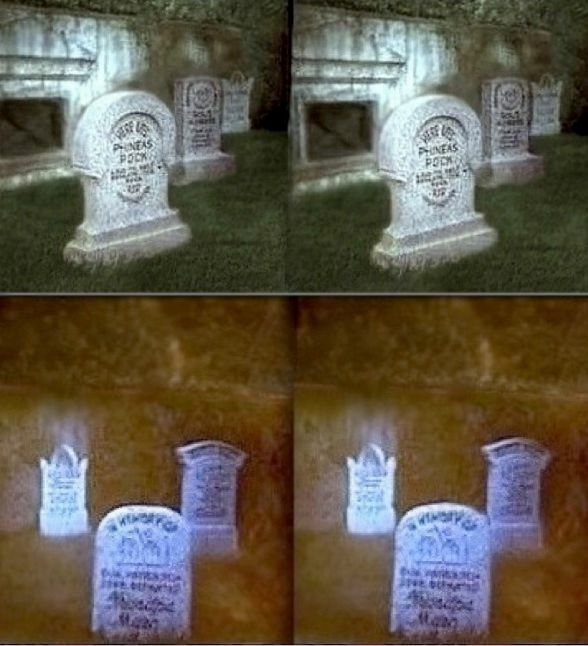 Between the two sets, a pair of cunningly-crafted animated gifs should show you exactly where the old graveyard was located. And since Long Forgotten is all about cunningly-crafted, here y'go (with our thanks to Captain Halfbeard for the gifs). versions in the post on that topic, so there is no longer any need for a miserable montage here. Check 'em out. Did I hear someone say they wanted "magic eye" 3D's? We got 'em, in two groovy sizes. Dude, it's like being there. You hear these epitaphs described as "witty" and even "frightfully funny," an example of Boot Hill-type gallows humor ("Here lies Lester Moore. Four slugs from a .44. No Les. No Moore."). Okay, many of them are, but let's face it: in others the whimsy is so subtle as to be practically non-existent. "In memory of our patriarch, dear departed Grandpa Marc." "Master Gracey laid to rest, no mourning please at his request." I have to stop here as my laughter becomes uncontrollable. No, really, if there's humor in there, it's so dry that even an Englishman might miss it. Don't get me wrong; I love it. It's the comedic equivalent of watching someone trying to see how slowly he can ride a bike without falling over. 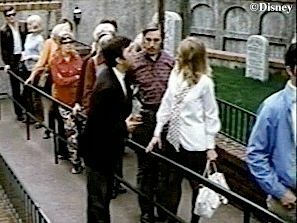 The family plot was actually constructed in June of 1969, and so it was there by opening day in August, but the park quickly realized that they needed more room for crowd control, and the graveyard was doomed almost from birth. 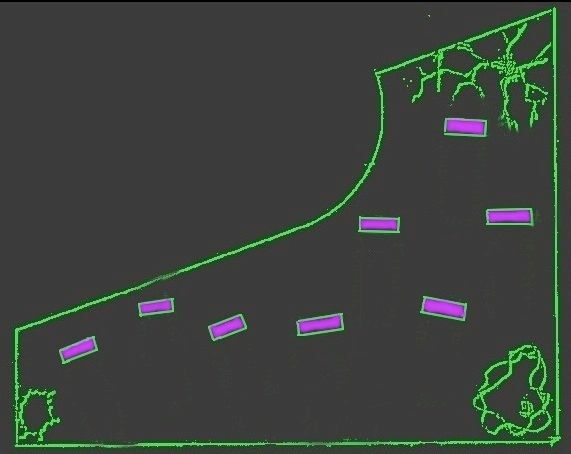 The current arrangement of back-and-forth queueing was already planned by the beginning of May, 1970, less than nine months after the Mansion opened, if the blueprints are to be believed. Sometimes, however, there is a considerable delay between a blueprint and the actual project. 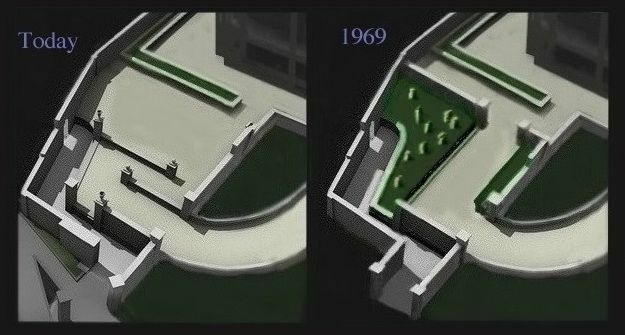 There is good evidence that the queue renovation did not occur until 1972. Best evidence at this point is that the latest possible date for its removal is early in 1973. 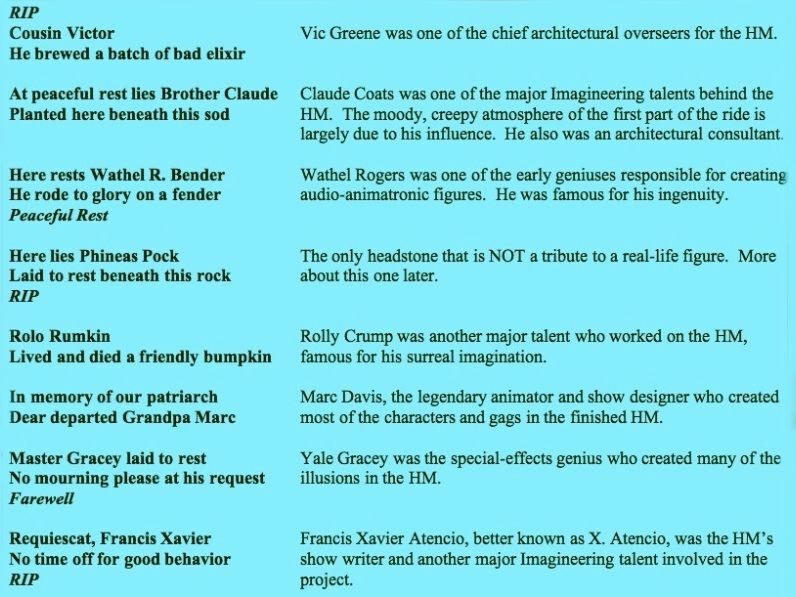 X wanted to award the stones to the Imagineers to whom they paid tribute, and so they ordered up a fresh batch of headstones for installation up on the berm. As it turns out, the only guy who took his tombstone home (as far as we know) was X himself. It's still sitting in his backyard today. 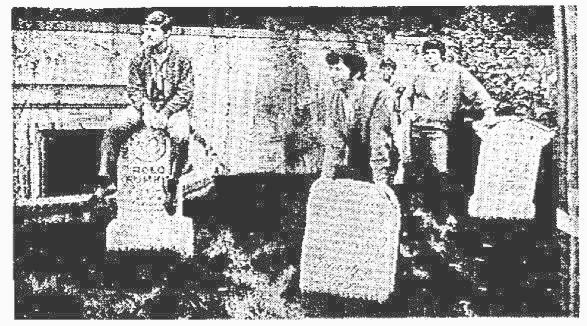 Marc's sat by his desk for a time, until he finally couldn't stand having his own tombstone staring at him while he was trying to work, and he got rid of it. 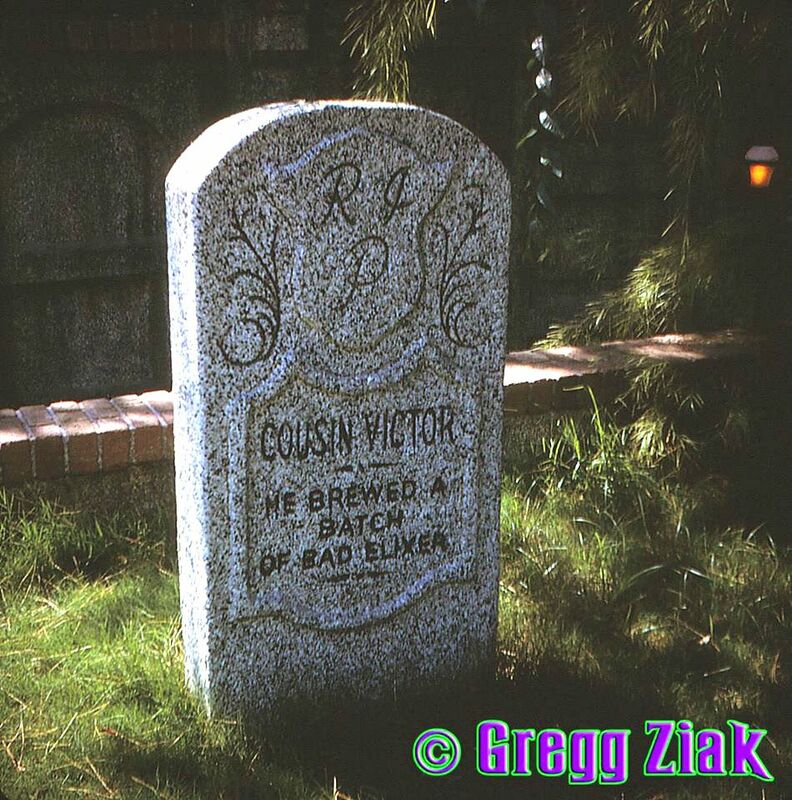 Rolly's stone ended up inside the ride, in the graveyard scene, not far from the singing bust that also goes by the name of Rollo Rumkin [sic]. Wathel Rogers' and Vic Greene's stones went onto the berm, along with Phineas Pock, which wasn't a tribute to anyone. The fates of "Master Gracey" and "Brother Claude" are unknown. I'll devote a whole post to the berm graveyard one of these days. 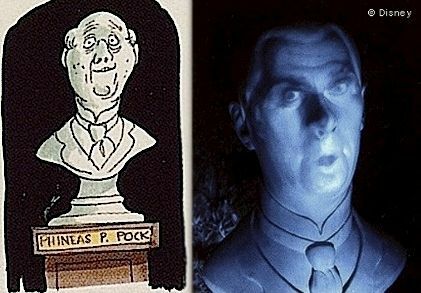 "Phineas Pock" may have originally been the name they were going to give to the Ghost Host. 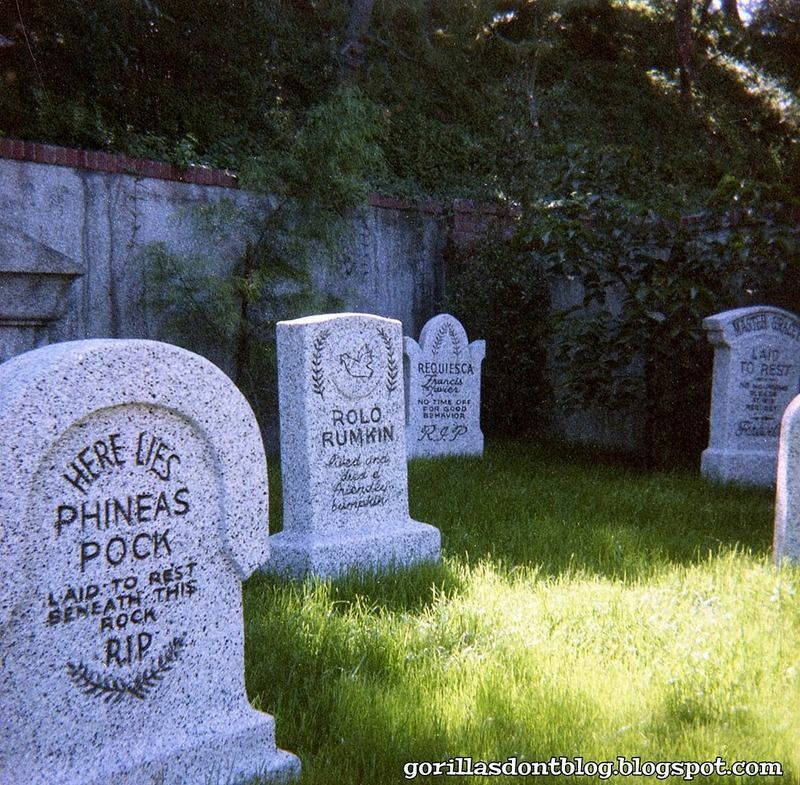 Reportedly, there's a blueprint around of an unused WDW tombstone reading "Phineas Pock, Lord and Master." Be that as it may, they got a lot of mileage out of the name. One of the singing busts is "Phineas P. Pock." It's on the blueprints and on the leaders for the film strips they used to use for the effect, so that one is as official as it can possibly be. 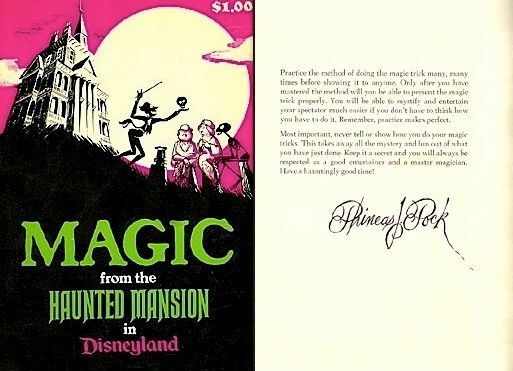 The purported author of the popular old souvenir booklet, Magic from the Haunted Mansion, is a certain "Phineas J. Pock." 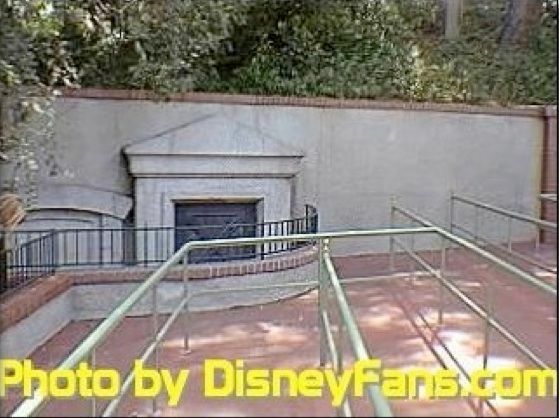 For the sake of completeness, I suppose I should mention that one of the new crypts in the WDW queue is for "Prudence Pock." 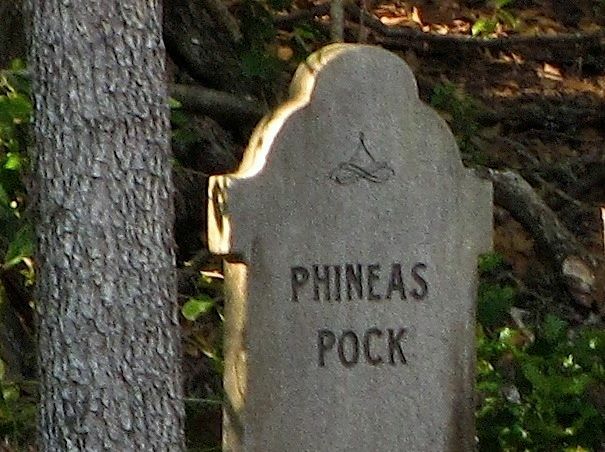 No doubt some people associate Mr. Pock with the rotund hitchhiker, who is also known as "Phineas," but that name actually originated with a cast member who probably was influenced by the plethora of Pocks already there. If you want to try to sort out this peck of Pocks, feel free. It's just a funny name. There is a great deal of logical continuity to the mass of data presented to you with the HM. 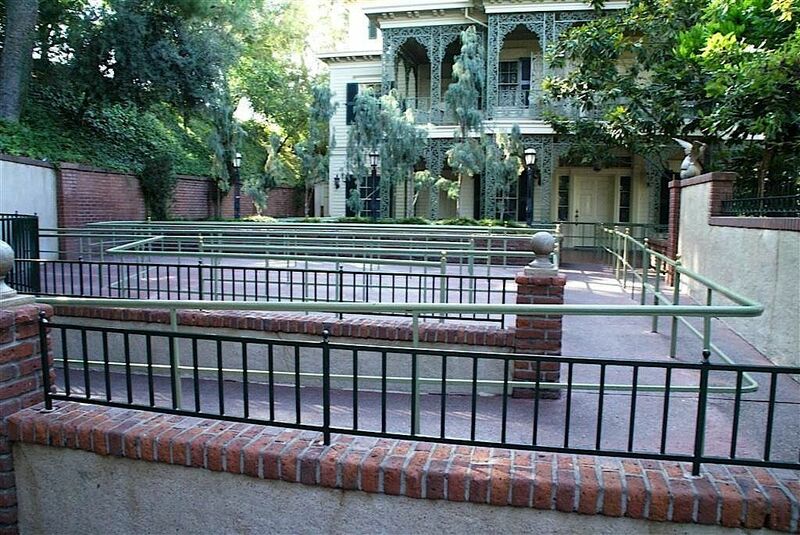 It's hard to know how much of it is deliberate, how much is dumb luck, how much is the Imagineering team's artistic instincts firing on all cylinders, and how much is the Haunted Mansion Muse, overseeing the project at all times and eliminating patent absurdities as they arise. The two human graveyards are a good example (there are two pet cemeteries too). 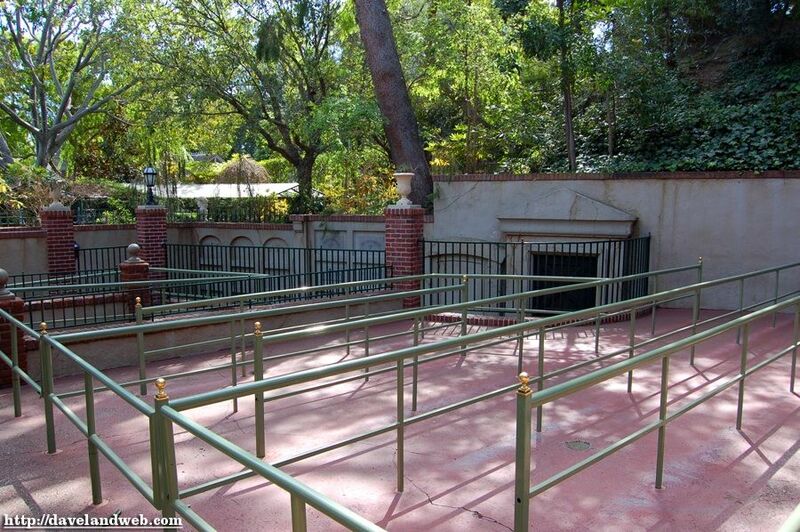 In your imagination, the queue graveyard—in either its ground level or its original berm incarnations—was not to be confused with the graveyard scene that provides the ride's climax. That graveyard is a very old public cemetery, next to which the Mansion was built sometime during the 19th c. It's "out back" in some vague sense, behind the berm and the trees, not visible from the front. 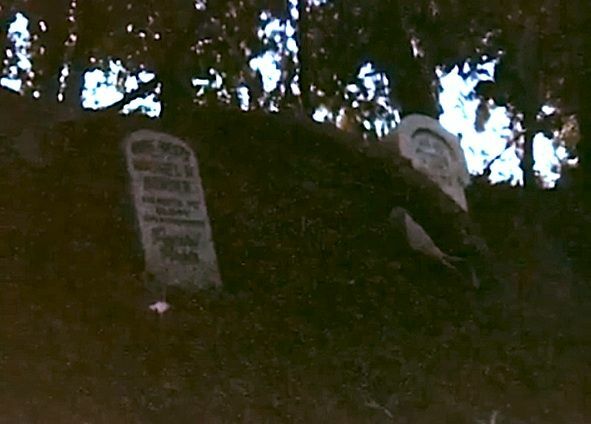 The Caretaker is not connected with the HM but is a public employee, caring for that old municipal cemetery. That's why you go through that big iron gate to get into it, and that's why Collin Campbell put a sign on the gatepost in his painting of it. It's "something-something Glade Cemetery." Maybe "Whispering Glade"? The headstones back there are uniformly in the style of 16th-18th century New England grave markers, and many of them are dated accordingly. They're much older than the house, in other words. There are hidden tributes on those, too, but that's yet another blog post. 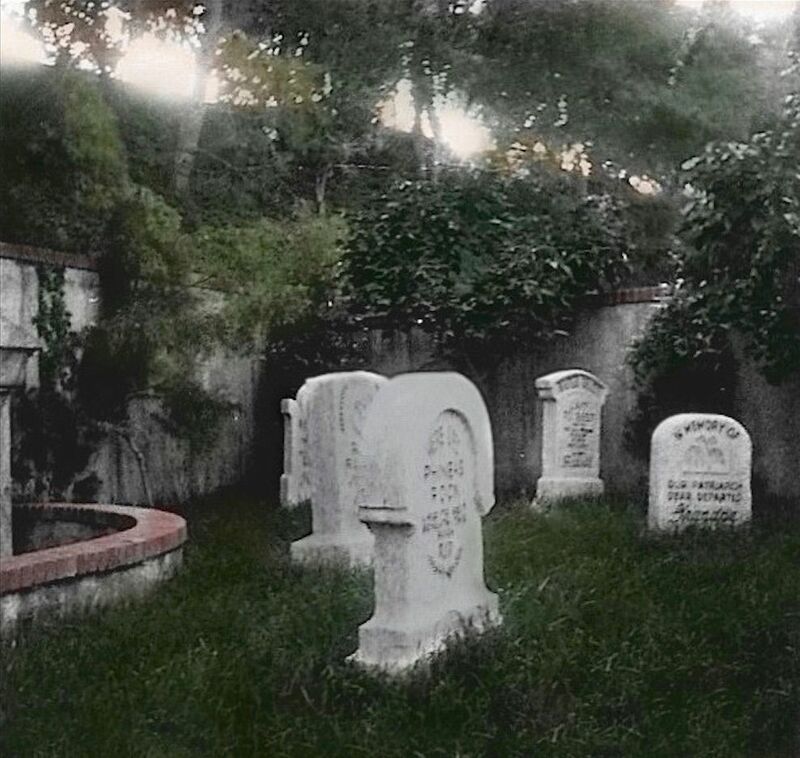 In contrast, the boneyard out front was, as I've already called it several times, the family plot, the private family burial grounds. 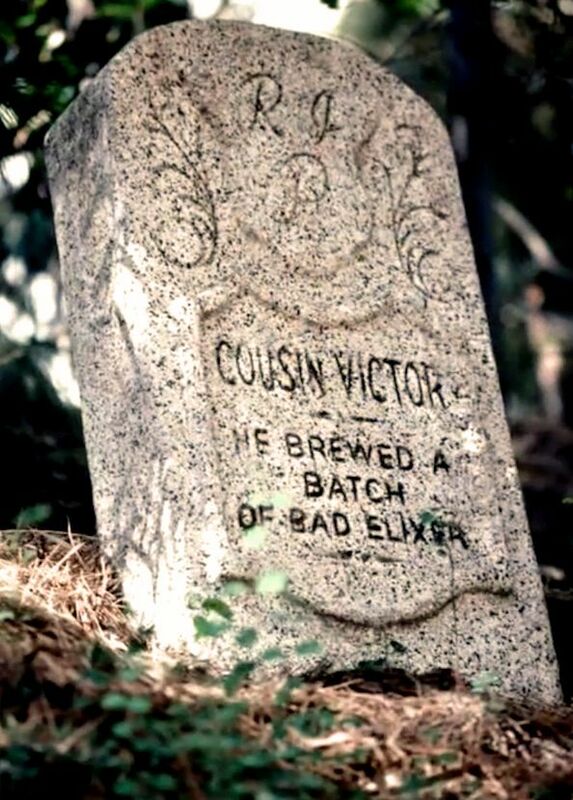 That explains the relatively modern (i.e., 19th c.) tombstone designs, and that explains the familial terminology: "Grandpa," "Brother," "Cousin." How carefully all of this was thought out—like I say, I can't tell. But the coherence in details like this, even when it isn't strictly necessary, is one of the things that embolden me to reach for the word "art" without embarrassment. There is an unexpected imaginative unity in the whole presentation. Whether or not the new (2016) berm graveyard follows suit is debatable. The stones are, for the first time, made to look old. They're worn and cracked. That, together with the wall-top fencing, might encourage guests to assume that the berm graveyard is simply the "back there" graveyard spilling over the hilltop and down to the wall. Be that as it may, our little tour of the short-lived, original, long-forgotten, front yard cemetery is now completed. That's odd; I don't remember that shot of the queue from the 1970 Osmonds/Russell film. It occurs well before the HM sequence that takes up the last part of the show. It's part of the segment in which everyone's looking for the lost Donny. 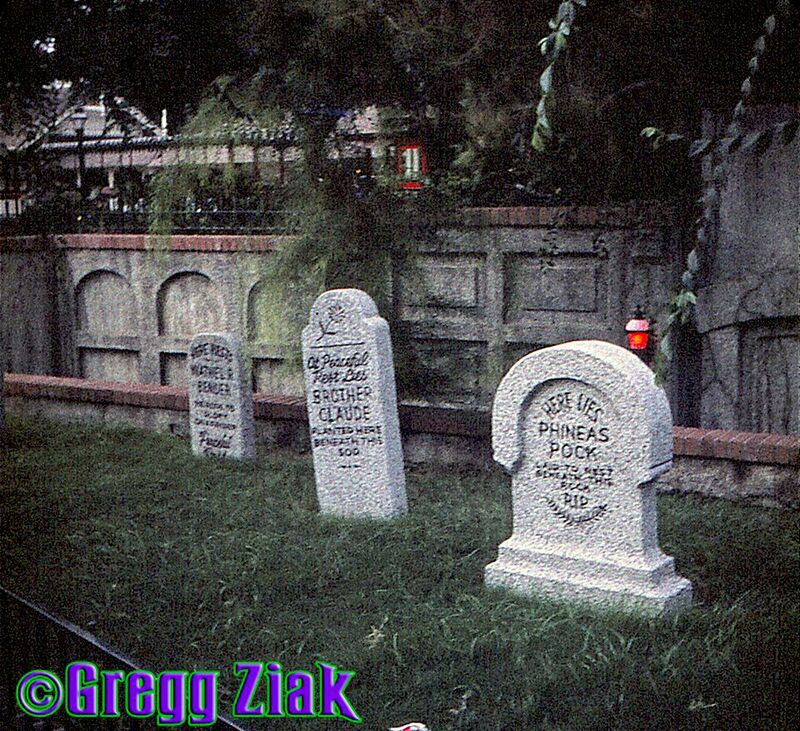 I wish they could AT LEAST bring back the berm tombstones. 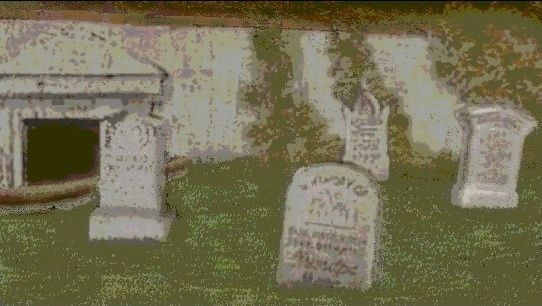 Even with the HMH overlay, the headstones would look magnificent mixed in with the jack-o-lanterns methinks! 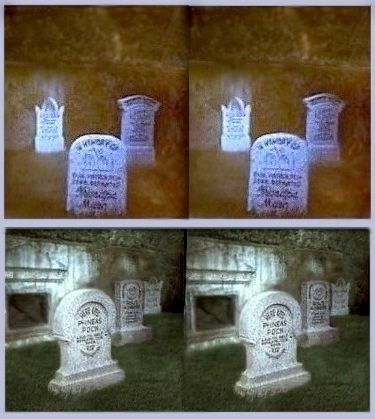 I can help you out with one of the interior tombstones. REST MURDNIW was created in honor of my father. His last name is Windrum (Murdniw backwards). He ran the Show Set Design department at W.E.D. 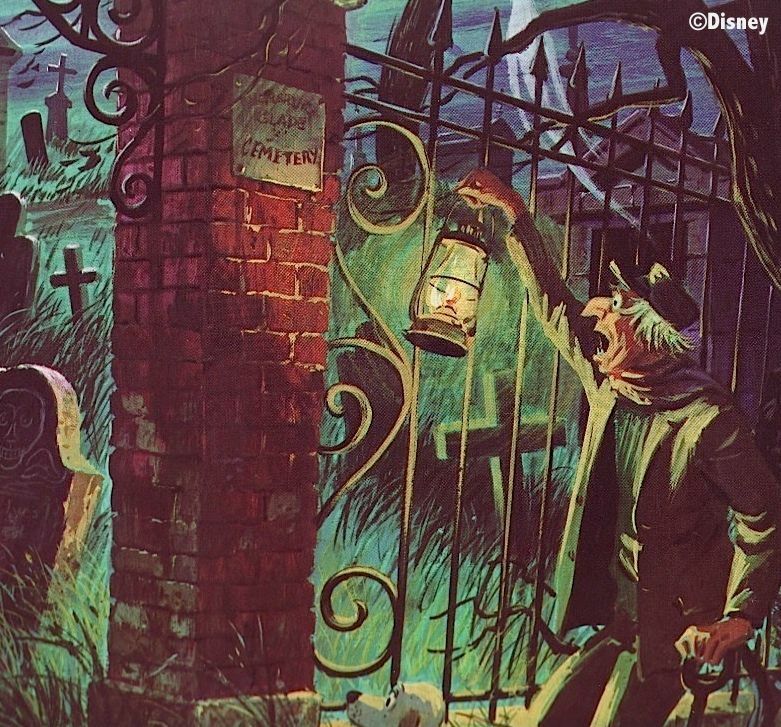 (former name of WDI)--creating working drawings for the interiors of many rides including the H. M.
There is also a little speculative discussion about George Windrum in the Comments on that post. It is George, isn't it? The tombstone actually reads MURDNIWG, "G. Windrum." Googling brings up very little info on your father on the internet, so any further info you can share would be appreciated not just by Mansion fans but by Disney fans in general. ha, I had forgotten Wathel Bender until reading this post. I remember my Dad laughing at that one. I remember it up on the berm, although I do remember the "family plot" from earliest visits. 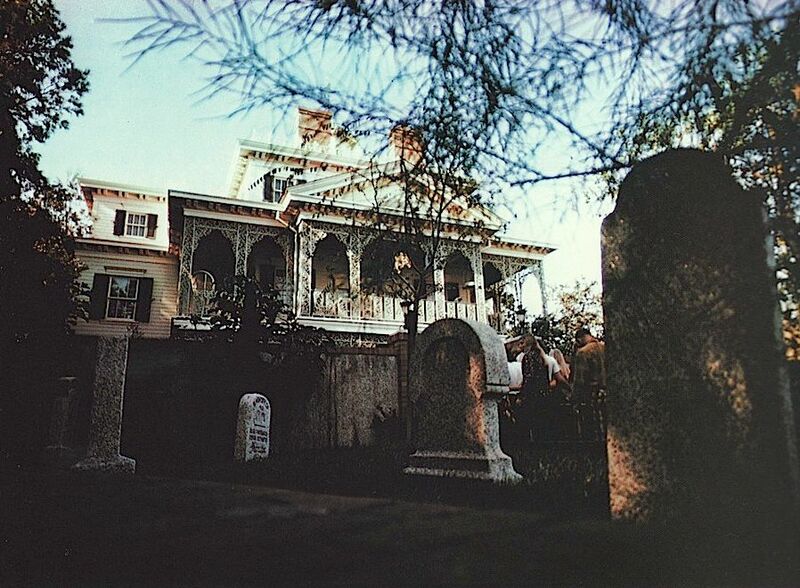 The only reference to a "private" graveyard on either souvenir record occurs when we are told that broken windows in the Conservatory allowed it to be seen. Nothing in the script indicates that it's the back graveyard. It could just as easily be the front (or side) graveyard. "Our adventurous pair descended the steps to the ground level and began their walk through the private burial ground, trying to find their way out of this living nightmare. They passed an old caretaker holding a lantern, too frightened to speak. His dog was cowering at his feet, whimpering." Oops, missed that one! If I wanted to use wire-drawn arguments, I suppose I could argue that they "begin their walk" through the private plot at the side of the house, "trying to find their way out," and eventually pass the caretaker en route to the public cemetery. In the ride we pass him before entering any graveyard, so the sequence of events in the S&S script is awkward, to say the least. The passing of the old caretaker at the beginning of the second sentence actually precedes the "beginning" of their walk through the burial grounds in the first sentence. But forget all that. I'd call it a blunder in the script. I JUST HAD TO POST THIS - I had no idea there was such interest in those tombstones until I happened upon this website - Since you've put so much time and effort into this project I just had to let you know some facts. 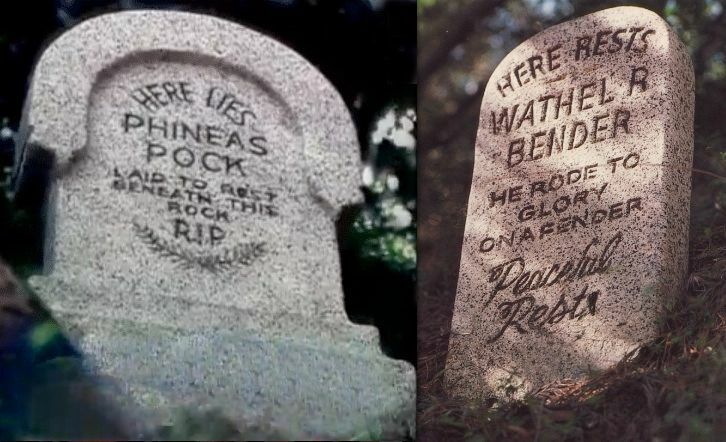 The Phineas Pock tombstone has not been seen in public since 1978 - there's quite a mystery about it's disappearance w/ a few blogs and articles being written about it (this being one of them) - But here's what all those others didn't seem to notice; along with Phineas' tombstone, there are actually "three total" tombstones missing from the hillside berm - all 3 missing since 1978 (check any dated photos you come across). Put your detective caps on and see if you can figure out the other 2 - here's a hint - one does not have the top cap that Phineas' does and the other is 1/2 the size of the other 2. Yes, they are fiberglass and foam filled but still very heavy (by a teenage boy's standards). 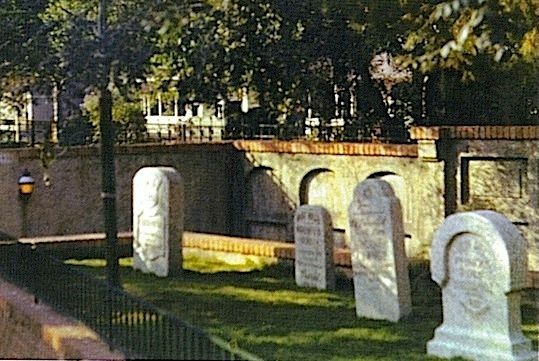 The 2 larger tombstones were held in place by 2 steel poles that went into the ground and into the bottoms of the tombstones - the smaller tombstone only had 1 pole. 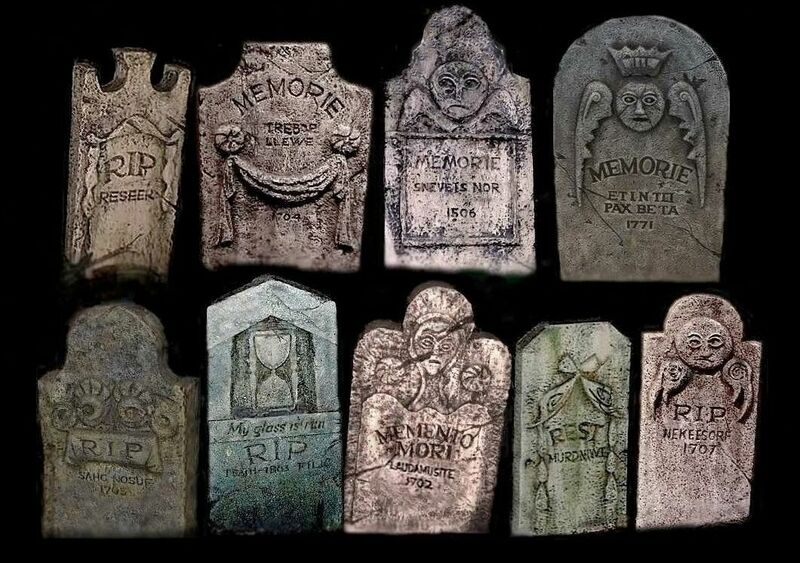 All 3 tombstones still exist and are in good shape - I saw a pic on this blog of one of the original 8 tombstones that has decayed (sad) I'm not sure where the other 5 original tombstones are or what shape they're in if they're even still around - but for all you fellow Haunted Mansion fanatics I had just had to post this and let you know that Phineas and his two companions tombstones are alive and well (unlike their namesakes) - too bad you can't post pics on this blog - I'd blow your minds! Seriously. 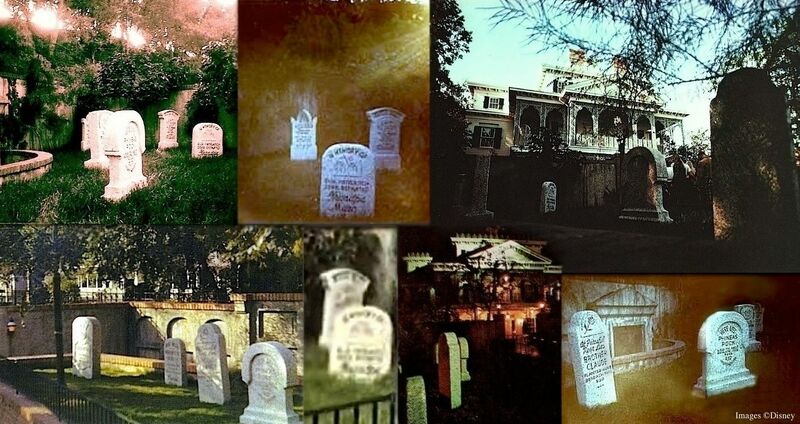 I've read some theories re; what happened to those tombstones = ALL of them wrong. I will tell you this - the true story is the greatest true life Disney tale of adventure a teenage boy and his two best buddies ever had! (another hint = "three" buddies total). 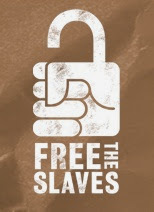 Anyway, after I saw this blog I figured I owed you some facts since you're a fanatic like me. Wow, great post as always. Ravens and One-Eyed Black Cats, Oh My!